Maybe we’re refining a surface and want to offset a polyline for a breakline or a border. As we navigate the OFFSET command, we receive a “Cannot offset that object.” message at the command line. If our polyline was created by bringing in survey data we may have some overlapping segments, zero-length segments, or other unwanted geometry. These items can cause the object to not be able to be offset. We can fix these geometry problems by using the commands -PURGE and OVERKILL. This will scan the entire drawing and remove all zero-length objects. Next type the command: OVERKILL and select the objects you wish to fix. The “Delete Duplicate Objects dialog box will appear. 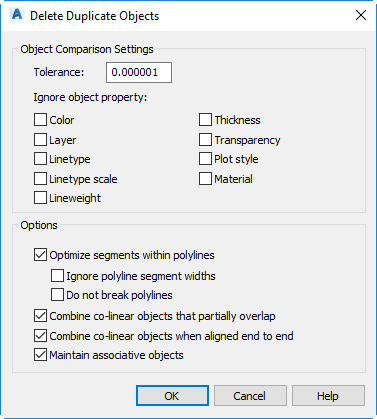 Select the object properties to ignore and select the options the command should use on the selected objects.